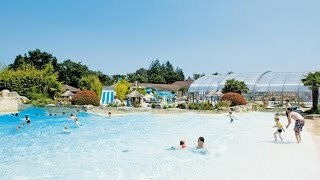 A secluded holiday village set in the heart of the forest, with many sporting facilities and a super spa centre, Leading Camping les Alicourts Resort is midway between Orléans and Bourges, to the east of the A71. There are 550 pitches, 115 for touring and the remainder occupied by mobile homes and chalets. All pitches have 6A electricity connections and good provision for water, and most are 150 sq.m. (min. 100 sq.m). Locations vary from wooded to more open areas, thus giving a choice of amount of shade. All facilities are open all season and the leisure amenities are exceptional. A member of Leading Campings group. The Senseo Balnéo centre offers indoor pools, hydrotherapy, massage and spa treatments for over 18s only (some special family sessions are provided). An inviting, part-covered outdoor water complex includes two swimming pools, a pool with wave machine and a beach area, not forgetting seven water slides. Competitions and activities are organised for adults and children, including a high season club for children with an entertainer twice a day, a disco once a week and a dance for adults. Three modern sanitary blocks include some washbasins in cabins and baby bathrooms. Laundry facilities. Facilities for families and disabled visitors. Motorhome services. Shop. Boutique. Restaurant. Takeaway dishes available. Bar with terrace. Pool complex. 7 water slides. Spa centre. Library. 6-hectare lake (fishing, bathing, canoes, pedaloes, cable-ski). 9-hole golf course. Adventure play area. Tennis. Minigolf. Boules. Roller skating/skateboarding (bring own equipment). Bicycle hire. WiFi (charged). From A71, take Lamotte-Beuvron exit (no 3) or from N20 Orléans to Vierzon turn left on to D923 towards Aubigny. After 14 km. turn right at camping sign on to D24E. Site signed in 2 km.